FACA Monthly Program – Who Get’s Grandma’s Yellow Pie Plate? 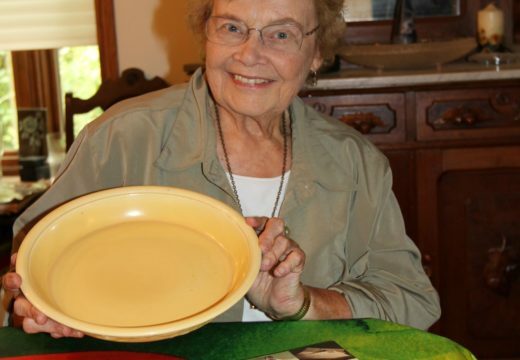 “Who Gets Grandma’s Yellow Pie Plate?” presented by Shirley Barber, retired University of Minnesota Extension Educator. Grandma always made pie for family gatherings? Mummuu’s pies were delicious and memorable. What objects in your family tell important family stories or are precious treasures in your life or your heritage? Shirley will share stories and offer things to think about when it’s time to pass family history and treasures to others, whether immigrant generation items such as trunks, mining lanterns, Finnish hand-crafted rugs, or contemporary items of Oiva Toikka birds, Aarikka and Kalevala jewelry, family cookbooks and recipes, furniture or other items in Finnish-American homes. This national award-winning, research-based program presents six critical factors to consider when making these important decisions to transfer personal property intergenerationally. Shirley will bring workbooks that interested persons can buy for $12.50, detailing important questions to consider about the 6 critical factors. Shirley grew up in a Finnish speaking household in rural Aitkin until she was ten when English became the household language. She has traveled to Finland numerous times visiting extended family members and attending Olli family reunions. The program is Sep 21, 2018, 7 p.m. at the International Institute of Minnesota, 1694 Como Avenue, St. Paul. Guests are always welcome. Coffee and conversation follow.